In this section we will cover the Spotlight IP Shader available in Title Studio with Continuum 2019. Spotlight adds a colored spotlight to the scene with blending modes and an optional alpha generator.. 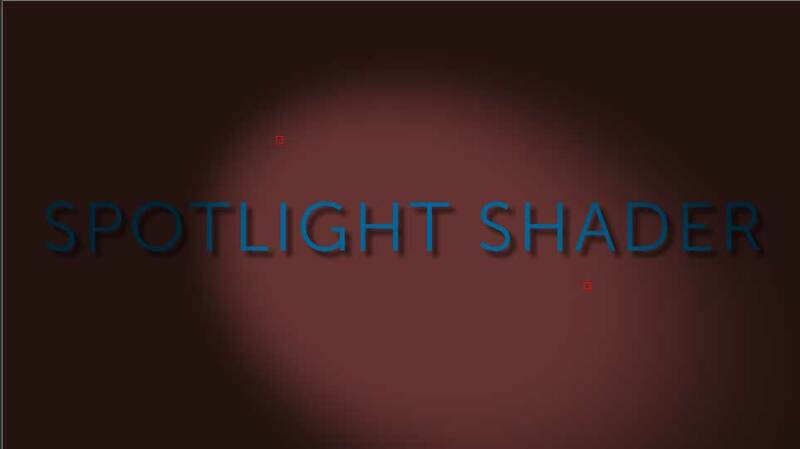 Unlike the Title Studio Spotlight, the IP Shader Spotlight can only be applied in 2 D Composite Mode and may be applied to individual objects within a scene. Source X & Y sets the source point of the spotlight. This is where the light originates from and it can be adjusted manually via the parameters or with the onscreen widget. Destination X & Y sets the destination point of the spotlight. This is where the light is focused and it can be adjusted manually via the parameters or with the onscreen widget. Offset X & Y sets the offset point of the spotlight. It can be adjusted manually via the parameter or with the onscreen widget. Elevation sets the height of the spotlight source point in relation to the destination. Higher values will move the source point further from the destination, increasing the radius of the spotlight. Lowering the Elevation will bring the source point closer to the destination, changing the shape of the spotlight. Spot Cut Off adjusts the focal point of the light source. Higher values will create tighter, narrower focal points. Edge Fall Off adjusts the softness of the spotlight edge. Lower values will create a sharper edge, while higher values will create a softer, more feathered edge. Intensity adjusts the overall brightness and intensity of the spotlight. Ambient adjusts the amount of ambient light that the spotlight generates. Higher values will result in more ambient light, allowing you to better visualize areas outside of the spotlight. Color allows you to use the color chip or eyedropper to set the color of the spotlight. Composite Mode allows the user to set how the spotlight composites within the scene. Standard composite modes Add, Multiply, Screen and Overlay are available. Generate Alpha, when enabled, uses the area outside of the spotlight to generate alpha regions.